Omega Music have supplied most of my ukuleles. I've stuck with them because of some excellent advice, and maybe, because I've been a relatively good customer, getting the inside track on offers and deals from the Cumbria based retailer. 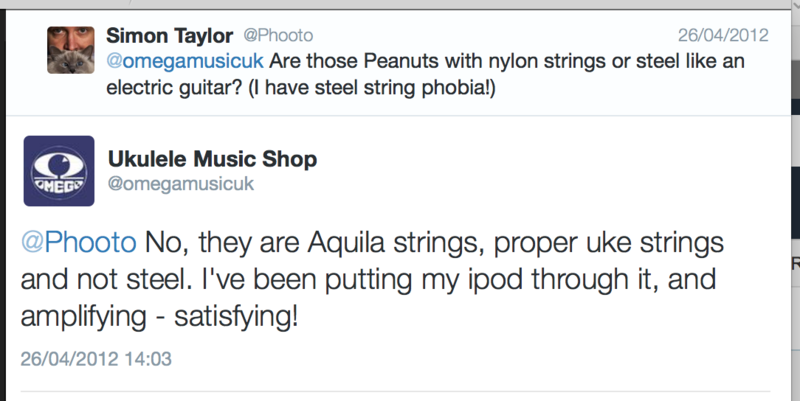 Matt Warnes from Omega, one of the main ukulele experts at the company found me asking a rather naive question on Twitter. He jumped in to answer my question, and I purchased straight away from them. This was a classic example of how Omega have been using social media the right way - listening and contributing, not ramming things down people's throats as many companies seem to think social media is for. In the time I've known them, they've stopped selling instruments that they didn't think were up to the mark, they have very honest descriptions of their items for sale and produce their own photography, rather than relying on the often inadequate and biased descriptions and pictures that manufacturers provide. In addition, Omega are instrumental in organising regular events and get-togethers, as well as UKE Magazine. One of the few suppliers that I have called to purchase a product and been told "why don't you consider this one, it's better and cheaper". Everything is set up before being shipped to customers, so a full inspection takes place - I've also bought a uke, a ding in the varnish was discovered during set up and inspection, so I was offered either another one, or the marked one at a discount. Just about everything comes with free shipping, most things are next day delivery, too. Never had a grumble with Omega, apart from them tempting me with new shiny stuff far too often! The cardboard boxes that the ukes are sent in are very solid and great fun for hiding in, too.